Super Sporty Friday w/Final 4 Fun, Benefit For Steve Gleason & More! If you're looking to stay away from the March Madness - no problem, there's plenty of other good stuff going on 'round town to keep you happy!! The cost of this event is free with regular admissions. Prices range from: $10 for adults; $8 for seniors, students, and military members; and $6 for ages 7-17. 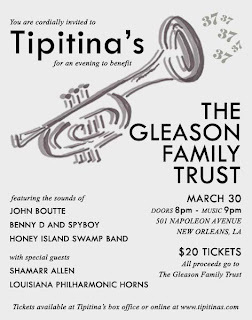 And there's a very special benefit tonight at Tipitina's - supporting the Who Dat Nation's Steve Gleason and the Gleason Family Trust - Check out the info and spectacular line-up below! Head on over to Chickie Wah Wah (2828 Canal) for Friday the Big Easy Weekender meet and greet - startin' up at 5:00 pm with Gallivan Burwell & the Predatory Drifters then stay on for the incredible Paul Sanchez at 8:00 pm, and then top off the evening with Sugarcane Jane all the way from Alabama at 10:00 pm! Come hungry too - there's delicious pizza and other yummy items being served up! d.b.a. (618 Frenchmen) has two great shows with Meschiya Lake & The Little Big Horns at 6:00 pm, and stay on of for The Iguanas at 10:00 pm! Stop by Mojitos Rum Bar & Grill (437 Esplanade - corner of Frenchmen) for some excellent margaritas and some great music all afternoon Alex Marti Trio at 4:00 pm, the Blues Trees at 7:00 pm and stay late for a Latin dance party with Javier Olondo & AsheSon at 11:00 pm!! Right down the street you have another trio of shows at BMC (1331 Decatur)...with El DeOrazio & Friends at 3:00 pm for an early happy hour, Jeff Chaz Band at 6:00 pm for more happy hour fun, and top off the night with a the Dana Abbot Band at 9:00 pm!! Thursday w/Wine, Concerts at the Parks, Boogalooin' and More!! Good Morning Everybody - Lots going on this beautiful Thursday! Don't miss out on the weekly wine tasting at Cork and Bottle (3700 Orleans) about 5:00 pm in Mid-City. Come sample some delicious vinos and kick off your early weekend right! You can also stop at Clever (right next door - don't even have to walk outside) for their happy hour specials after attending the free wine tasting and tonight they're gonna have a crawfish tasting too! And be sure to stop by the Crescent City Farmer's Market (right outside the door) and patronize local Louisiana vendors with fresh veggies, seafood and more!! And there's a new concert series!! Armstrong Park Thursdays kicking off tonight with the Marlon Jordan Trio and Robin Barnes. 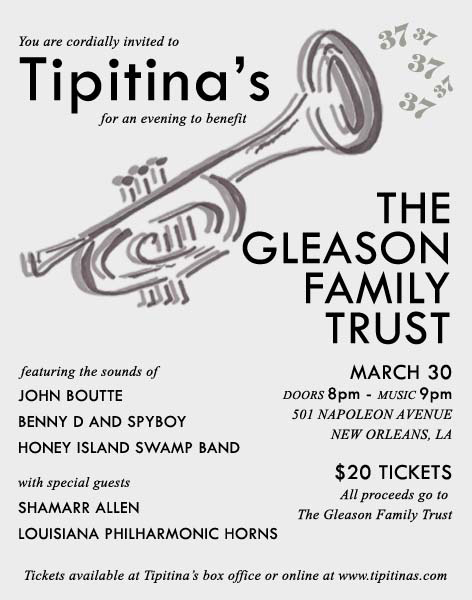 The concert is the first of five with upcoming performances from Mike Baptiste and Juice and Da Krewe, Donald Harrison and Troy Sawyer, James Andrews and the Craig School Brass Band, and Kermit Ruffins. 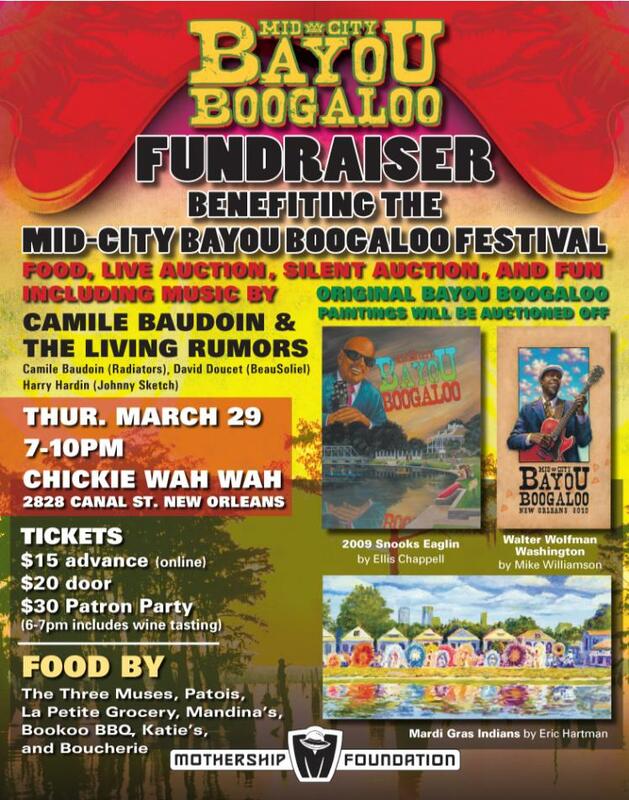 The concerts will run from 5 to 7 p.m. and come hungry - there will be food from Café Treme, Wine and Bistro, Jacques-Imo's Café, and more...Fun!! Need a little art, culture and music? You gotta go to the show at the Ogden Southern Museum of Art (925 Camp St.) - better known as Ogden after Hours. Tonight the Ogden presents Aurora Nealand - Playing saxophone, clarinet and accordion, as well as being a vocalist and composer, Aurora Nealand is one of a handful of traditional jazz musicians who dabbles in the local free improv scene, as well as Klezmer, Western Swing and Balkan music! And be sure to head on over to the bar for this month's signature cocktail the - The Blarney Stone: A combination of Jameson Irish Whiskey and other flavors will definitely give you the gift of gab! Remember if you're a member of the Ogden you always get in free! There's more fun on Frenchmen over at d.b.a. (618 Frenchmen) with piano man Jon Cleary at 7:00 pm with no cover!! And stay on for more music with Colin Lake ($5 cover) at 10:00 pm - you don't want to miss it!! Stay in the neighborhood - come early and stay late at Mojitos (437 Esplanade Ave.). They've got Peter Novelli Band at 6:00 pm and stay on for the super talented bluesy women of 30x90 at 9:30 pm!! Wednesday at the Square with some Post Square Music and Fun! It's a warm and beautiful Wednesday! It looks like it's going to be a rainy day, but we're hoping the Square can be spared!! So come on down to Lafayette Square for another stellar line-up for this year's concert series....there will be crafts, food and libations....Big Sam's Funky Nation plus The Wise Guys get things movin' this evening at 5:00 pm - and check out the entire line-up so you can make your plans. Head on over to Galvez (914 N. Peters) and there new music venue. You can enjoy great food while enjoying the best view of the Mississippi River tonight at 6:30 pm with The Marc Stone Duo with special guest John Gros! Enjoy some more fun after the Square over at the 12 Bar (608 Fulton) - the fun kicks up at 7:00 pm - they're gonna have crawfish, New Orleans Rum specials, the Brass-a-Holics Brass Band and the 610 Stompers will be filming for the Peep Show! Have triple the fun in Mid-City when you head on over to Chickie Wah Wah (2828 Canal) for some happy hour fun with the Sweet Olive String Band at 5:00 p.m., Meschiya Lake & Tom McDermott at 7:00 pm and to top it off - Marc Adams and the House of Clements at 9:30 pm - what a night! And come hungry - the kitchen is kickin' with pizza and all kinds of yummy food! Looking for some dinner and then some music for dessert? Rock 'N Bowl (3016 S. Carrollton) can help you out! Get an entree' over at Ye Olde College Inn and then get a half price ticket to the show right next door at Rock N' Bowl....Tonight you'll be dancing the night away with Johnny Angel and The Swinging Demons at 8:30 pm!! There's great music this evening on Frenchmen Street tonight at d.b.a. (618 Frenchmen) catch the early show at 7:00 pm with Paul Sanchez with Alex McMurray and Washboard Chaz - and stay on for Walter "Wolfman" Washington and the Roadmasters at 10:00 pm - cover's only $5.00 and you know the Wolfman's worth it! Head on down to Mid-City and to Chickie Wah Wah (2828 Canal) for the Guitar Masters at 8:00 pm - Phil DeGruy, John Rankin, Jimmy Robinson - cover is only $5!! Don't forget to come hungry for some delicious pizza and other good stuff from the kitchen!! There's more fun in Mid-City over at the Banks Street Bar (4401 Banks) come by for The N'Awlins Johnnys at 9:00 pm and don't forget about the FREE red beans tonight! Satisfy your hunger for great food and music over at Three Muses (536 Frenchmen)...Tonight they've got Iguana man Joe Cabral and his Trio - don't miss the show! And two great shows at the Maison (508 Frenchmen) with The Royal Roses at 7:00 pm, and The New Orleans Super Jam at 9:30 pm. Be sure to make a stop by the Spotted Cat (623 Frenchmen) early for this great line-up of music...Brett Richardson at 4:00 pm, Dominick Grillo and The Frenchmen Street All Stars at 6:00 pm and be sure to stay on for the Jazz Vipers at 10:00 pm.....it's sure to be another jazzalicious Monday evening show. Weekend Fun in NOLA w/Hogs, Beer, Roadfood, Crawfish, Pups & Pirates! Happy weekend and we deserve it - what a beautiful day and so much to do!! First things first!! The delicious smell of pork and the amazing sounds of music are filling the air over at City Park today for Hogs for the Cause! This pork lovers extravaganza includes 60 competing BBQ teams plus lots of beer, food and trucks and of course music! 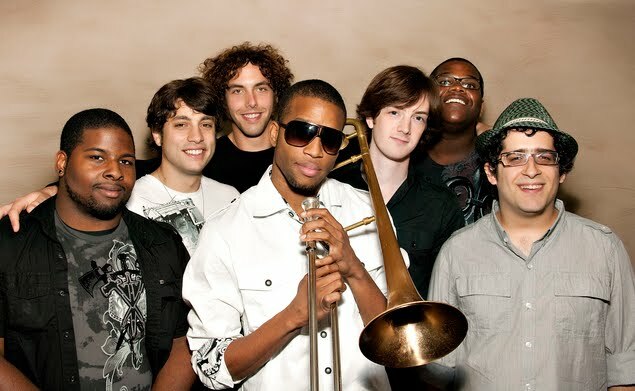 The musical line-up is spectacular with Trombone Shorty and Orleans Avenue, Voice of the Wetlands Allstars, Marcia Ball and more!! And remember all the money goes to a worthy cause - to aid families with children suffering from pediatric brain cancer. 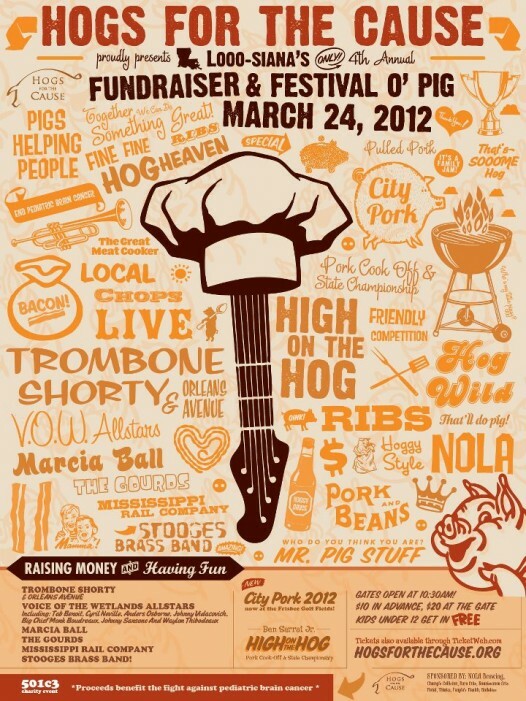 So get high on the Hog for a very good cause! 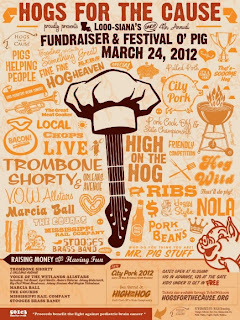 Tickets are $10 in advance and $20 at the gate - Gates open at 10:30 am - for more info click www.hogsforthecause.org! And on Sunday City Park goes to the dogs with Dog Day Afternoon!! 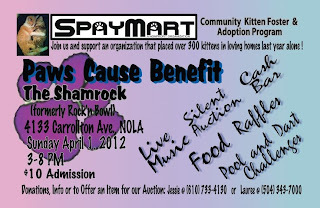 Enjoy a day of dog loving activies with a dog walk-a-thon, food, games, dog contests music by Amanda Shaw and and the Cute Guys all funds to to benefit the LA/SPCA!! Festivities take place at City Park's Big Lawn (near the NOMA entrance) - it's gonna be a doggone good time ya'll!!! Ahoy me' maties!! It's NOLA Pyrate Week with art, music, food and general swashbuckling for pirates and pirate lovers!! 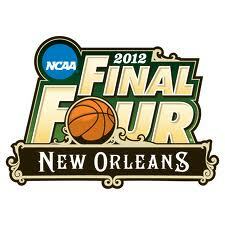 For all the fun and festivities click on www.nolapyrateweek.com! TGIF w/Chalmette Crawfish Fun, Festivals Galore & Lots o' Music!! There's sooo much going on this weekend - I wish I could be in two places at once!! The Louisiana Crawfish Fest is kickin' in Chalmette, and the fun starts up tonight at 6:00 pm and all weekend long. There's going to be plenty of amazing food, music and you can ride the rides for one low low price!! Click on the link for all the info!!! Hangin' in the Quarter this beautiful evening? Head first to Jackson Square and the premier spring performance of Bon Operatit! at the Upper Pontalba starting up at 4:00 pm. There's gonna be three free concerts this spring at the Upper Pontalba on Jackson Square. Limited seating provided; so bring your own chairs. Singers will be performing from the balcony at 520 St. Peter Street. Fun!! Head on over to Chickie Wah Wah (2828 Canal) for Friday the Big Easy Weekender meet and greet - startin' up at 6:00 pm with Phil Lee doing a short happy hour set, then on to Davis Rogan Band until 9:45 pm and then back to Phil Lee at 10:00 pm! Come hungry too - there's delicious pizza and other yummy items being served up! 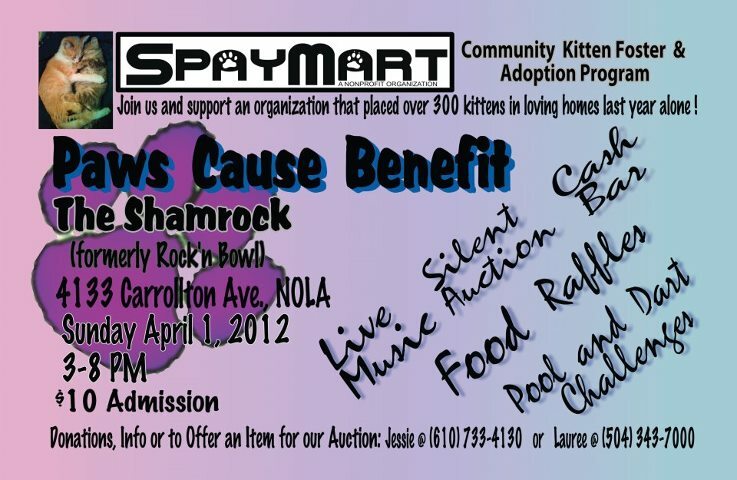 And there's more good music in Mid-City (almost Uptown) over at Rock 'N Bowl (3016 S. Carrollton). Dance the night away with Mixed Nuts at 9:30 pm!! Remember if you eat at Ye Olde College Inn right next door you get a discount to the show! Happy rockin' and bowlin'! Stop by Mojitos Rum Bar & Grill (437 Esplanade - corner of Frenchmen) for some excellent margaritas and some great music all afternoon Andre Bouvier & the Royal Bohemians at 4:00 pm, Indian Cigars at 7:00 pm and stay late for The Soulabilly Swampboogie Band at 11:00 pm!! Right down the street you have another trio of shows at BMC (1331 Decatur)...with El DeOrazio & Friends at 3:00 pm for an early happy hour, The Touchables at 6:00 pm for more happy hour fun, and top off the night with the Dana Abbot Band at 9:00 pm!! Tomorrow is another day with the New Orleans Roadfood Fest, Hogs for the Cause, The New Orleans International Beer Festival, Taste at the Lake, and more Crawfish!!! Click on all the links so you can make your weekend plans!! A Wednesday w/Antiques, Fashion, and Music Music Music!! Rain rain go away!! Here's to hoping those weather guys and gals are totally wrong!! If you're a lover of antiques, music, food and drinks stop by the Crescent City Auction Gallery (1330 St. Charles) between 5:00 and 8:00 pm for they're Grand Opening Celebration with an evening of fine food, entertainment by Kristin Diable and of course antiques and art! It looks like it's going to be a rainy day, but we're hoping the Square can be spared!! So come on down to Lafayette Square for another stellar line-up for this year's concert series....there will be crafts, food and libations....Tea Leaf Green plus Colin Lake get things movin' this evening at 5:00 pm - and check out the entire line-up so you can make your plans. And right on across the street at 7:00 pm for the Fashion Week New Orleans Kick Off Party at Twist (628 St. Charles)...Mix and mingle with top designers, special & celebrity guests, industry professionals and fashionistas in a toast to Fashion Week New Orleans 2012!! Have triple the fun in Mid-City when you head on over to Chickie Wah Wah (2828 Canal) for some happy hour fun with the Sweet Olive String Band at 5:00 p.m., Meschiya Lake & Tom McDermott at 7:00 pm and to top it off - David Mayfield Parade at 9:30 pm - what a night! And come hungry - the kitchen is kickin' with pizza and all kinds of yummy food! Looking for some dinner and then some music for dessert? Rock 'N Bowl (3016 S. Carrollton) can help you out! Get an entree' over at Ye Olde College Inn and then get a half price ticket to the show right next door at Rock N' Bowl....Tonight they've got Johnny J. and The Hitmen with Derek Huston at 8:30 pm!! Move down Frenchmen for a great show at Three Muses (536 Frenchmen)....it's Schatzy at 7:00 pm...if you didn't think you were a big fan of accordians this performance will change your mind!! A Tuesday w/Veggies, Mad Men, 2x the Music at Chickie's & More!! You can get your day started off right with a trip to the Farmer's Market!!! 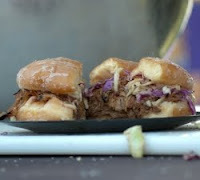 Visit the Crescent City's Farmer's Market at University Square (200 Broadway) from 9:00 to 1:00 pm and Chef Shane of Fat Hen Grocery is serving up lunch under the Green Plate Special Tent. This week BBQ smoked okie round steak "bologna" sandwiches with mustard slaw, Thai-style cucumbers, house-smoked pit baked beans and freshly baked espresso-chocolate chip cookies....yummy!! Celebrate the fabulous '60's at the Carousel Bar and Lounge (214 Royal) with the Mad Men Party tonight from 6:00 to 8:00 pm. Celebrate the fifth season of Mad Men with a 60's themed soiree and costume contest. Actor Bryan Batt, former star of the popular drama series, will serve as special guest and costume contest judge. In keeping with the theme, The Yat Pack will perform hits from the 60's in the style of Sinatra and company. Complimentary themed cocktails will be served including Absolut® Vodka Gimlet, Beefeater®Gibson and Chivas® Rob Roy. Hotel Monteleone is providing 60's-inspired hors d'oeuvres for guests throughout the event. For those who want to dine like a "mad man," "The Unofficial Mad Men Cookbook: Inside the Kitchens, Bars and Restaurants of Mad Men" will be available for sale alongside local bookstore Octavia Books. Head on over to Mid-City and to Chickie Wah Wah (2828 Canal)! They've got two amazing shows with Tommy Malone on guitar and Bill Malchow on piano at 8:00 pm, and stay late for Greensky Bluegrass at 10:30 pm - and come hungry for delicious pizza, pasta, salads and more!! St Joseph Feast at Isrealite Church 3000 Frenchmen St. Doors open 12 Noon. Given by: Bishop Brumfield. SAINT JOSEPH'S ALTAR Opening For Viewing 7am-7pm 3533 ELYSIAN FIELDS AVE.
ST JOSEPH ALTAR The Greater New Orleans Italian Cultural Society. Viewing at Holy Rosary Academy 3368 Esplanade Ave. in school cafeteria - 9am till 4pm. Holy Mass in Our Lady of The Rosary Church 11am. Immediately after mass the public will be served Pasta Milanese. Music provided by American Legion Post 175. For info call Dom Grieshaber (504) 494-2058. St Joseph Altar The Zanca Family 4113 Tchoupitoulas St. Sunday, 9 AM-3 PM All are welcome. St Joseph Altar at Ozanam Inn 843 Camp St. N.O.LA. 70130 Open 10:am-6:00 Daily, Everyone Welcome! Sponsored by St. Patrick Church. ST. JOSEPH ALTAR In Memory of Dianne Williams 724 Marengo St. New Orleans 8:00 am to 3:00 pm. St Joseph's Altar given by the Noote Family. 208 Cougar Dr. in Arabi, LA. Feeding the public after 12:30pm. ST. JOSEPH ALTAR at the Lost Love Lounge-2529 Dauphine St. New Orleans, LA 70117 VIEWING today. CROSS Mark & Gina Farrugia invite you to attend a St. Joseph's Altar at their home at : 416 Shrewsbury Ct. Jefferson from 12:00 p.m. to 7 p.m. It's a Musical Monday Uptown, in Mid-City and on Frenchmen! Head on down to Mid-City and to Chickie Wah Wah (2828 Canal) at 8:00 pm for a performance by guitarist, Rayland Baxter as he makes a stop at Chickie's before heading over to SXSW (tix are $10). Don't forget to come hungry for some delicious pizza and other good stuff from the kitchen too!! There's more fun in Mid-City over at the Banks Street Bar (4401 Banks) come by for Love Betty at 8:00 pm and don't forget about the FREE red beans tonight! Weekend Fun - The Italians & Irish Are Coming plus Oysters, Markets, Music & More! The Italians are coming!! The Irish are coming!! It's that time of year for fava beans, flowers and cabbages - let's see what's going on this weekend! Head on down to the Quarter early for the Louisiana Oyster Jubilee at 10:00 am at Musical Legends Park (311 Bourbon). 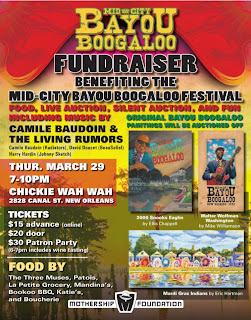 There's gonna be music, and food with the world's longest oyster po-boy!! The "Best Oyster Po-Boy in New Orleans Competition" kicks off at 10 am with the construction of the humongous sandwich..cutting and distribution begins at Noon. First come first served - so get there early - yum!!! Head on out to the Piety Street Market (The Old Ironworks - 612 Piety St.) from Noon to 5:00 pm. There's gonna be live music by Mas Mamones and a special performance by The Bards of the Bywater with Helen Gillet, Mark Growden, Troi Bechet, Alex McMurray, Aurora Nealand, James Singleton and Larry Sieberth at 4:00 pm! And of course, 40+ vendors offering an eclectic assortment of art, handmade jewelry and crafts, homemade goodies, vintage collectibles and flea market finds at this bustling neighborhood market. If your heading down to the Quarters for the Day be sure to stop by the Old U.S. Mint (400 Esplanade) for Jazz at the Mint at 2:00 pm for the concert "Vozes Inspiradas", a showcase of Brazilian jazz with Cindy Scott, Sasha Masakowski and Leah Chase with a six piece band. After parading head on over to Chickie Wah Wah (2828 Canal) they've got a really big show this evening with another triple header of music! The music starts early with Sami.the.Great at 6:00 pm, then it's the New Orleans Guitar Masters with Cranston Clements, Phil DeGruy, John Rankin and Jimmy Robinson, then top off the night it's the Harmed Brothers at 11:00 pm...wow - what a line-up! The first round of St. Patrick's Day parades kick off on Sunday with the Old Metairie St. Patrick's Day Parade at noon. The group begins at Archbishop Rummel High School on Severn and makes it way to Metairie Road. There's going to be lots of flowers, beads, and of course cabbage!! For those of you not in the parading mood...no worries...there's plenty of other good stuff going on. After brunch head take ride on the ferry over to old Algiers. It's Algiers Friendship Day on Algiers Point (corner of Olivier and Patterson) from noon to 6:00 pm. It's a big old street party with green beer, hot dogs, cabbage and lots of music! Don't miss out on the fun! The Nickel-A-Dance concert series continues over at the Maison on (508) Frenchmen Street at 4:00 pm with Herlin Riley and the Hot Foot Floozies. The free series runs the entire month of March and it's family friendly - so bring the gang!! Happy Thursday w/Hot Stuff, an American Idol & Lots Mo' Music! Good Morning Everybody - Happy Thursday!! Need a little art, culture and music? You gotta go to the show at the Ogden Southern Museum of Art (925 Camp St.) - better known as Ogden after Hours. Tonight the Ogden has the super talented Lauren Turner. Lauren is a powerhouse vocalist who sings from the heart. By age 8, she was performing songs by Tanya Tucker, Patsy Cline and Judy Garland, and made a name for herself singing regularly at church, being called the "little girl with the big voice." Lauren was also a finalist on season 4 of "American Idol." And my hubby, Bill deTurk will be doing the interview - so, it's gonna be an extra good evening! Be sure to head on over to the bar for this month's signature cocktail the - The Blarney Stone: A combination of Jameson Irish Whiskey and other flavors will definitely give you the gift of gab! Remember if you're a member of the Ogden you always get in free! If you get there a little early head by the Circle Bar right around the corner on Lee's Circle for some great drinks!! And stop by after the Ogden too for Pree with Hannah Kreiger-Benson + Julie Odell at 10:00 pm! There's more fun on Frenchmen over at d.b.a. (618 Frenchmen) with piano man Jon Cleary at 7:00 pm with no cover!! And stay on for more music with The Louisiana Hellbenders ($5 cover) at 10:00 pm - you don't want to miss it! !